Home / NEWS • Outlander • The Lovely Erica • TV Heartbeat / TV Heartbeat Breaking News!! Outlander FINALLY has a premiere date!!! Gorgeous artwork and a season 2 premiere date!!! The end of Droutlander is in sight!!! We have a Roger and we have have Bree. Now we have a premiere date! The Season 2 of Outlander begins April 9th! 58 days to plan your viewing party! Can you believe how gorgeous this teaser poster is?!?!? Let’s get this started! We have a war to stop! Beverly Hills, Calif. – February 11th, 2016 – Starz, in association with Sony Pictures Television, has announced the return of its hit original series “Outlander” on Saturday, April 9th at 9PMET/PT. The eagerly awaited second installment will be 13 – episodes and is based upon the second of eight books in Diana Gabaldon’s international best-selling Outlander series, entitled Dragonfly in Amber. 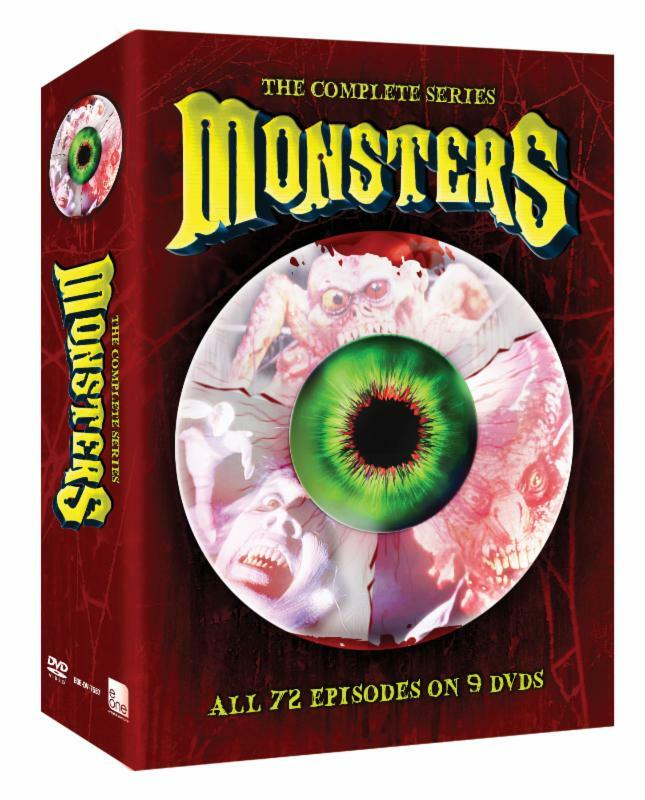 The series is executive produced by Ronald D. Moore (“Battlestar Galactica,” “Star Trek: Deep Space Nine,” “Star Trek: The Next Generation”). 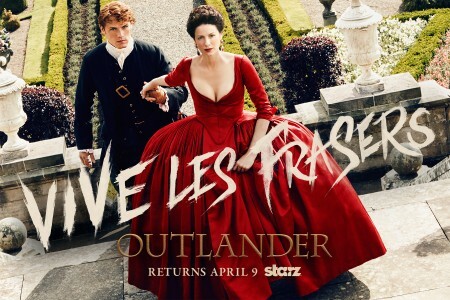 Starz also released a first look at their teaser art featuring “Outlander” couple Claire Randall Fraser (Caitriona Balfe) and Jamie Fraser (Sam Heughan) on the steps of Versailles. Instead of swords and guns, they’re armed with political savvy and the finest 1700s Parisian fashion as they embark on their new mission – infiltrating the French aristocracy and rewriting history. The new image gives viewers a taste of what’s to come in this exciting and dangerous next chapter – old world lavishness mixed with a sense of new world urgency. The teaser art was shot on location in Scotland by photographer Jason Bell. Book Two of “Outlander” begins as Claire and Jamie arrive in France, hell-bent on infiltrating the Jacobite rebellion led by Prince Charles Stuart, and stopping the battle of Culloden. With the help of his cousin Jared, a local wine merchant, Jamie and Claire are thrown into the lavish world of French society, where intrigue and parties are abundant, but political gain proves far less fruitful. Altering the course of history presents challenges that begin to weigh on the very fabric of their relationship. However, armed with the knowledge of what lies ahead, Claire and Jamie must race to prevent a doomed Highland uprising and the extinction of Scottish life as they know it. Diana Gabaldon’s eight-book series has sold more than 26 million copies worldwide and all eight books in the series have graced the New York Times best-sellers list. AFI’s Announces their Best Film and TV Shows of 2017! Wonder Woman! The Good Place! Dunkirk! Lady Bird! And More! Shadowhunters making Shadow Puppets! Random fun with OTF! 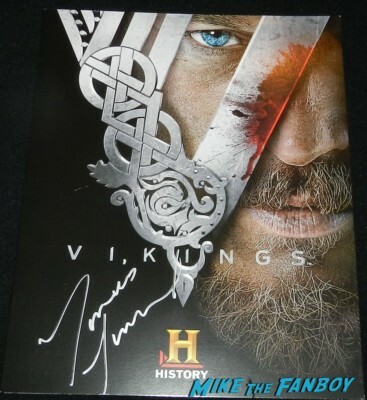 Vikings Is Adding Some Hunger Games To It’s Cast! Talk About Being Bjorn Again! Doh!